How do I use the Wish List feature? 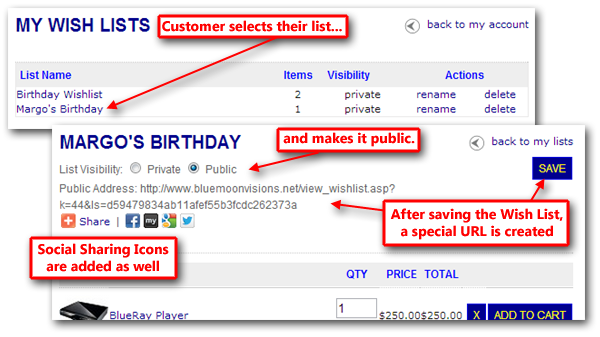 The wish list feature allows your customers to add products to a list for tracking purposes. The customer can return and login to their account at any time to view and edit their list of products. The returning customer can choose to purchase products directly from the wish list as well. Beginning in version 6 of the 3dcart Software, merchants can also allow their customers to create multiple wish lists as well as publicly share them on Social Media channels. In this article, we'll show you how to implement and use the 3dcart Wish List feature. Then, use the search bar at the top to search for "Wish List" to view the module. This will allow registered customers to create separate wish lists on their account. Marking this checkbox will allow customers to make their wish lists publicly viewable and able to be shared on social media channels like facebook. Once the module is enabled, your product listing pages will be displayed with a link, inviting registered customers to add a product to their wish list. As mentioned in the previous section, enabling the module will add a special link to your product listing page inviting customers to add the item to their wish list. Clicking on the link will open up a pop up window that will allow the user to add the product to their wish list. If the user is already logged into their customer record account, the product will automatically add to their wish list. However, if they are not yet logged in, the system will redirect the user ot the My Account login section of your store. They can also create a new customer record if they do not yet have one. Once the item is added to the wish list, the customer can return at any time to the store and log into their account to view or edit their wish list as needed. They can even purchase items directly from their wish list at any time. Clicking on the "View Details" link next to their "My Wish List" section. Customers can purchase items from their wish list at any time. However, please note that purchasing the item from the Wish List directly does not remove the item from the list. Instead, it will be up to the customer to update their wish list accordingly. As the merchant/admin of the store, you have the ability to review products which have been placed on a wish list. Then, upon reviewing the Wish List products, you can see the customer records that have the item added to their individual wish lists. Furthermore, you can see which customers have since ordered the item, as well as create a special Newsletter Smartlist for customers wishing for that one item. Here you will see a listing of each product which has been placed on a wish list. The graph will display the item ID, Item Name, and how many lists the item is present on. Clicking on the Action Wheel and selecting "Edit" will let you view a listing of the customer records that have placed the particular item on their respective Wish Lists. From here, you have a few options to choose from including: linking up to the customer record, logging into the customer record (to remove purchased items from Wish List), and viewing any orders in which the customer may have already purchased the wished for item. You can use the Filter button on the internal Wish List page to find your products more easily. You can also use the column headings to sort the listings as needed. Then, when viewing the product specific Wish List page, you can also use the column headings to sort your listing for ease of use. While viewing the Wish List details page, Merchants can also create a Newsletter Smartlist specifically for the product. To do this, look to the top right of the Wish List details page and click on the "Create SmartList" button. Clicking on the "Save" button in the Create Smartlist section will let you create a SmartList for all users who have added the specific product to their Wish Lists. The "Ignore Prod. Options" checkbox is intended to group together wish list customers for the base product, regardless of whatever options they selected for the wished product. By marking the "Ignore Prod. Options" checkbox, you can create one smartlist for all five wish lists to consider the main product sans the selected options. Once created, this Wish List Product Smartlist can then be used to send those customers (who have not yet purchased the item) a new marketing email enticing them to purchase it. Wish List Item is listed as a Deal of the Day or Group Deal today and you'd like to send a notice to these customers of it. Wish List Item is now considered for the Make an Offer feature. Notify these customers to encourage purchase. Wish List item is being discontinued and you'd like to notify these customers to purchase now "while supplies last!" How do I use the Newsletter SmartLists? Merchants can allow their customers to create multiple wih lists on their account. This can be useful to shoppers who want to create different wish lists for different occasions. Perhaps one wish list would be their own personal wish list populated with items intended for their own use, while another wish list may be for products they someday wish to purchase for a child or significant other. Another possibility is a general wish list for impulse items, while another wish list is for a particular event or holiday season. To enable this option, you will need to mark the "Allow Multiple Wish List" checkbox on the Wish List Module (mentioned in the first portion of this article). If the checkbox is not marked, then the Wish List function will function for the customer as described so far in this article. If the checkbox is marked however, customers will be given the option of creating a wish list name when they first designate a Wish List Item. Subsequent wish list item additions will then give the customer the option of adding to a specific wish list or creating a new one. 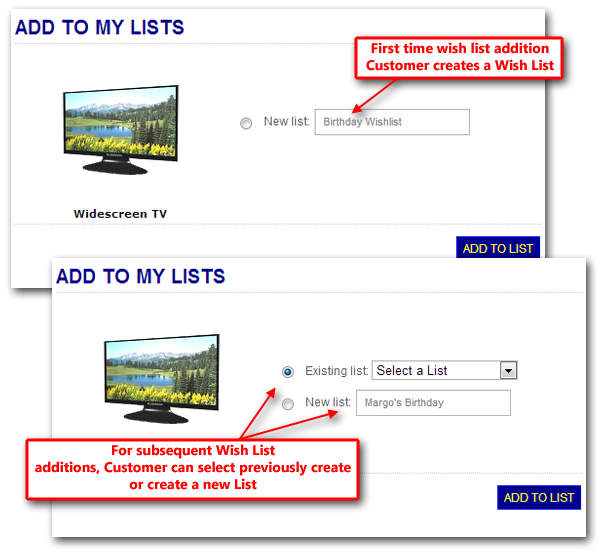 With the Multiple Wish List functionality enabled, customers can also view, rename, delete and edit their Wish Lists as needed. Merchants also have the ability to allow the creation of Public Wish Lists for their customers. When enabled, your customers can elect to make their wish lists publicly available via a special URL created for their wish list that can be shared with anyone they choose. When viewed, additional visitors using the Wish List link will then see the wish list's items and can purchase them on their own. This would be useful in that it allows a customer to share a particular wish list with their friends and family for a special event like a birthday or holiday. Sharing a wish list can also be used for event planning situations like charity drives or other types of public events. To enable this option, you will need to mark the "Allow Multiple Wish List" checkbox on the Wish List Module (mentioned at the start of this article). If the checkbox is marked however, customers will be given the option of making the wish list publicly available. This will then generate a special URL that will allow the Wish List to be viewed by anyone with the proper web address. This URL can then be shared with anyone the customer wants to have access to their List. If Social Bookmarking* is enabled on the store, the public wish list will also contain links to popular social media channels with which the customer can share their list. To enable Social Bookmarking, go to Marketing ->Social Bookmarking and place a mark in the "Enable" checkbox. Then "Save Changes"